MAT 126 is the second semester of the three-semester calculus sequence MAT 125, 126, 127. We will study during this semester integration. We will often need to use the theory of differentiation, which was covered in MAT 125, and also trigonometry. Prerequisite: The prerequisite for this course is C or higher in MAT 124 or 125 or 131 or 141; or level 6 on the Mathematics Placement Examination. This exam will be given on several dates in September; check the Math Undergraduate Office (P-144 Math Tower, phone 2-8250) for times and places. 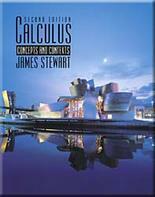 Textbook: The required textbook is Calculus - Concepts and Contexts (Single Variable), 2nd Edition, by James Stewart. Check the syllabus to determine which sections will be covered each week, and come to class having read those sections. Reading the textbook will greatly increase your comprehension of the lectures and enable you to ask useful questions in class. Furthermore, the lecturers and recitation instructors will not always be able to cover all of the subject material for which you will be responsible. Lectures and Recitations: New material is presented each week in the lectures. The recitation each week gives students a chance to review, in a smaller class, material from the week before. This includes going over difficult parts of assigned homework, and new exercises, proposed by the recitation leader, to be carried out individually or in groups. Recitation leaders can give valuable feedback to the lecturer. Try to make sure your recitation leader knows who you are! Internet Access: Announcements concerning MAT 126 such as lecture topics, homework assignments, room assignments, etc will be found on this web site and on Blackboard, as well as links to supplementary material such as review sheets and practice examinations. Some course materials will be posted in PDF format and so will require for printing/reading the use of the (free) Adobe Acrobat Reader. Login on Blackboard to access the Discussion Board for all sections of MAT 126. To access it, once logged in on Blackboard, click on the Communication tab and then click on Discussion Board. All registered students at Stony Brook should have Blackboard accounts. Students who did use Blackboard during the Fall 2002/Spring 2003/Summer 2003 semesters should know that their passwords remain the same. Download here the Blackboard Student Guide (Fall 2003). Calculators: Students will be expected to have calculator with graphing capability for use in lectures and recitation sections, on homework and on examinations. Graphical calculators are good learning tools because they allow to visualize and analyze functions as well make numerical calculations. However, calculators implementing computer algebra, such as the TI-89, may NOT be used during examinations. Math learning center: The Math Learning Center (MLC), located in Room S-240A in the Mathematics Building, is an important resource. It is staffed most days and some evenings by mathematics tutors (professors and advanced students); your lecturer and recitation instructor will hold at least one office hour there. For more information and a schedule, consult the MLC web site. Students with disabilities: If you have a physical, psychological, medical or learning disability that may impact your course work, please contact Disability Support Services (DSS) office: ECC (Educational Communications Center) Building, room 128, (631) 632-6748. They will determine with you what accommodations are necessary and appropriate. Arrangements should be made early in the semester (before the first exam) so that your needs can be accommodated. All information and documentation is confidential. Students requiring emergency evacuation are encouraged to discuss their needs with their professors and Disability Support Services. For procedures and information, go to the following web site http://www.ehs.stonybrook.edu/fire/disabilities.asp.